Known for The Grapes of Wrath, Of Mice and Men, and The Pearl, John Steinbeck remains a central figure in the American literary canon. His award-winning works commented on the social and economic issues faced by working-class Americans during the Great Depression. 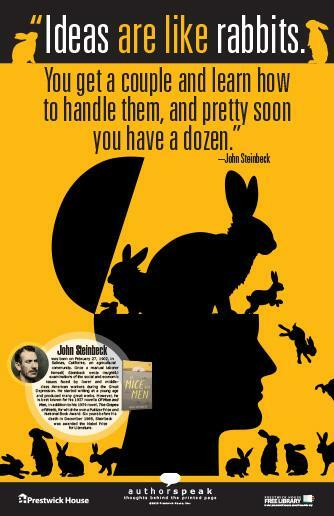 Bring Steinbeck’s humor and wit to your classroom with this free poster featuring his oft-quoted “rabbits” simile. Share your love of John Steinbeck with this free full-color 11”x17” poster. More new puzzles, posters, eBooks, and lesson plans are being added to the library all the time, so sign up now, and we’ll e-mail you as soon as a new resource is added. Have an author that you’d love to see a poster for? We’d love to hear from you, so leave us a note in the comments!